The zippered welt pocket is the kind of feature that elevates the style of any handmade bag! 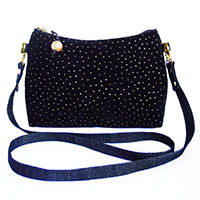 You can install one on the outside of a bag, or in the handbag lining. They can be oriented horizontally, vertically, or even on the diagonal. I’ve included a 12″ welt zipper pocket on the inside of all my tote bags, because having at least one zip pocket on the inside of a big bag is always a good thing. The welt pocket seems scary at first, I know. It’s true there are many steps, and this is NOT one of those times where I’m going to say “close enough” is close enough. You have to measure, mark, cut, and sew very precisely for this to work. But I do not say that to scare you! The good news is: all it takes is a little practice to get perfect zippers. Let’s get started! First, decide if you’re going to add tabs to the ends of your zipper. 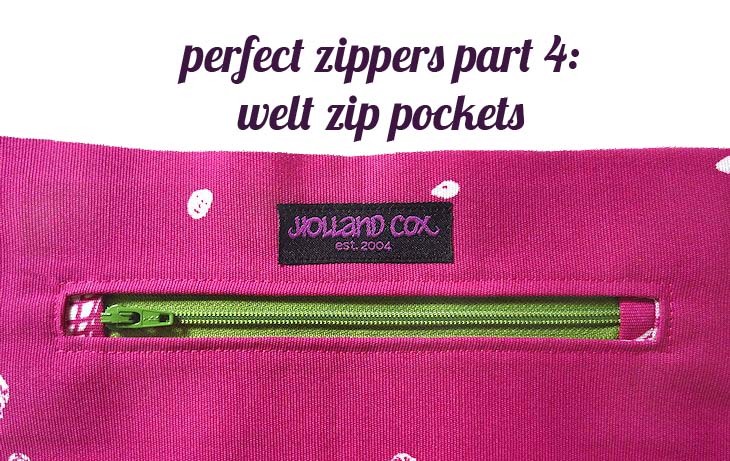 Check out part 3 of my perfect zippers series for two ways to make zipper tabs. This step is totally optional! I would probably skip it if I had a metal zipper. Next, you’ll have to cut and mark the welt. 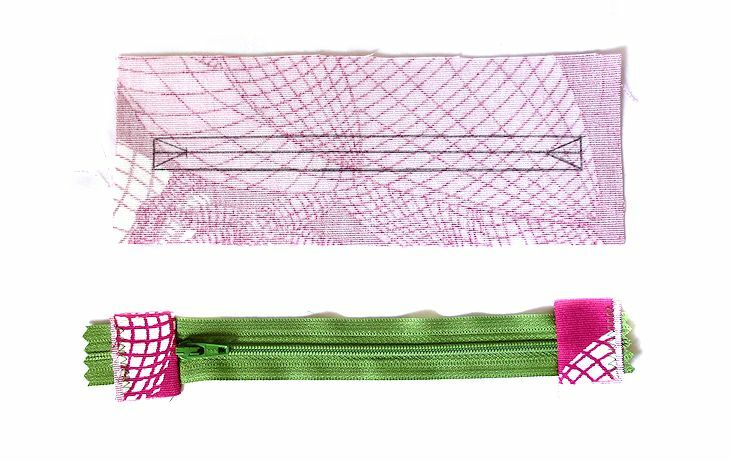 The welt (the pink fabric above) is the fabric that you’ll be stitching into your bag in order to create the opening the zipper will peek through in the end. It needs to be significantly wider and taller than your zipper. The marks you’ll be making on the welt (the pencil marks on the fabric above) are where you’re going to stitch and cut to make the magic happen. It also has to be a tiny bit bigger than your zipper, but not too much bigger! For this tutorial, I started out with a 7″ zipper, but with the fabric tabs added, it’s actually only 6.5″ (keep this in mind if the size of the opening in your finished pocket is really important, e.g. something specific needs to fit into said pocket). It’s a good idea to pick light weight fabric for both the welt and the zip tabs, to make pressing and sewing in the zipper easier! Thinner fabric will reduce bulk at the corners, and make for a smoother, flatter looking welt opening in the end. The mark I drew for my 6.5″ zipper measured 7″ x .5″. Anything bigger than a half inch will make the welt opening too big for your zipper (unless you have a zipper with truly huge teeth – bigger than 10mm). Think of it like this: the opening has to be bigger than the zipper teeth, otherwise opening and closing the zipper will be difficult. BUT it also has to be smaller than the zipper tape, otherwise stitching the zipper in will be impossible. Not much room for error! The welt I cut for this project measured 8″ x 3″. You want to give yourself a fair bit of clearance on every side of the mark, otherwise stitching in the zipper will be unnecessarily difficult. Give yourself at least .5″ on either short end of the mark, and at least a full inch on each long side of the mark. For this tutorial, the welt is cut from the same fabric as the bag lining it’s going to get sewn to (this hot pink canvas from Ikea), because it is fairly lightweight. If I was worried about bulkiness, I’d use a lighter weight fabric in the same hot pink color. The outer rectangle marked on the welt (the 7″ x .5″ mark) will be your stitching line. You need to mark your cutting lines, as well. Draw a line exactly half way through the mark width wise, and 1″ shorter length wise, stopping .5″ from each short end of the mark. From the ends of this line, draw diagonal lines to meet the corners of the original mark. This line, with a “V” shape at each end, are your cutting lines. Depending on your fabric and your zipper, you might be able to skip this step. But most of the time (and all of the time if you are using a zipper with metal teeth), you’ll want to reinforce the fabric where the zipper will be inserted. You are going to be actually cutting a hole in your bag fabric! The fabric will need to be able to hold up the zipper itself, plus the weight of whatever ends up inside the pocket! Use woven, fusible interfacing for the strongest support. Cut it about the size of your welt, and apply it to the wrong side of the bag fabric where the welt zipper will be inserted. Next, take your welt and pin it to your bag, with right sides together. Take a moment to make sure it is lined up the way you like – perfectly horizontally or vertically or whatever you want. It’s a good idea to put your pins in at an angle, and also make sure the points of the pins are facing the stitch line. 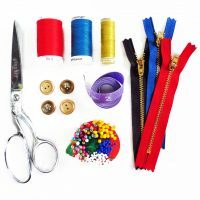 This ensures that the fabric stays as flat as possible, and also that the pins stay out of the way while you’re sewing, so you don’t have to worry about taking them out as you go. This illustrates one of the reasons the welt has to be sufficiently bigger than the mark! If it’s too small, it makes pinning it down and stitching accurately that much harder. 1. Start sewing the outer edge of the welt mark in the middle and not on one of the corners (see the arrow above). 2. Slow down as you approach the corner, using your hand wheel for the last few stitches to make sure the needle hits the corner exactly (it is 100% okay to make your stitch length smaller as you approach the corner, in order to be really sure that you don’t go too far). Leave the needle down in the fabric before you turn. 3. 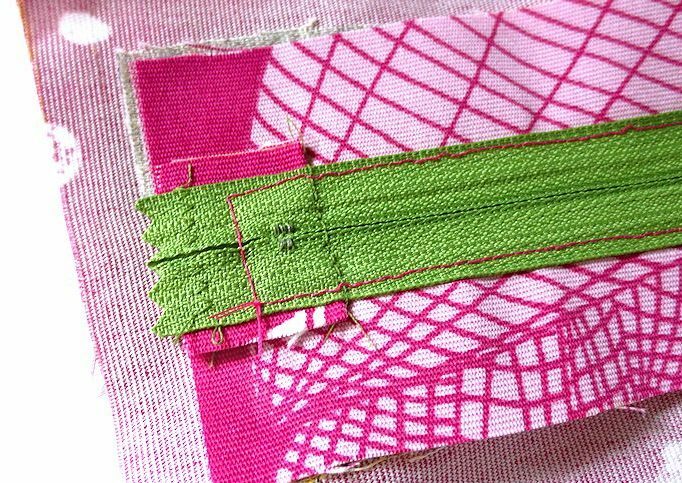 Use your hand wheel to stitch down the short ends of the rectangle. The side benefit of “walking” over the short end of the mark, is that you can count your stitches, so you can make sure the other end is exactly the same! Here’s what the welt looks like from the wrong side of the fabric after it’s been stitched in. The only stitching is on the outside of the mark, and there is no backstitching at the corners or at the end…when you get back to the place you started, make sure your stitches overlap for about an inch, and that’s it! Get out your sharpest, tiniest embroidery scissors or thread nippers for this step! First, you’re going to cut down the long center line going down the middle of your welt. Go slowly and be careful to cut right on the line you marked, through both your bag fabric and the welt, so that there’s the same amount of fabric on either side of the cut (.25″ in our example). 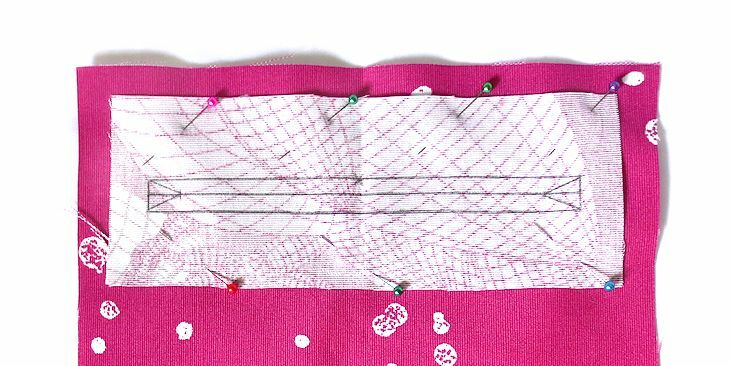 At the “V” shape lines that extend to the corners, make sure you snip all the way into the corner without actually cutting the thread from your stitching in step 4. This is why you’ll need tiny, sharp scissors to make this happen, because if your snips don’t go far enough, you’ll never get a nice looking welt opening in the end. Again, go slowly and snip a little bit at a time! Here’s the magic part! 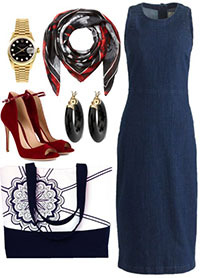 Flip the welt to the wrong side of the fabric, and you will see your lovely rectangular opening appear. 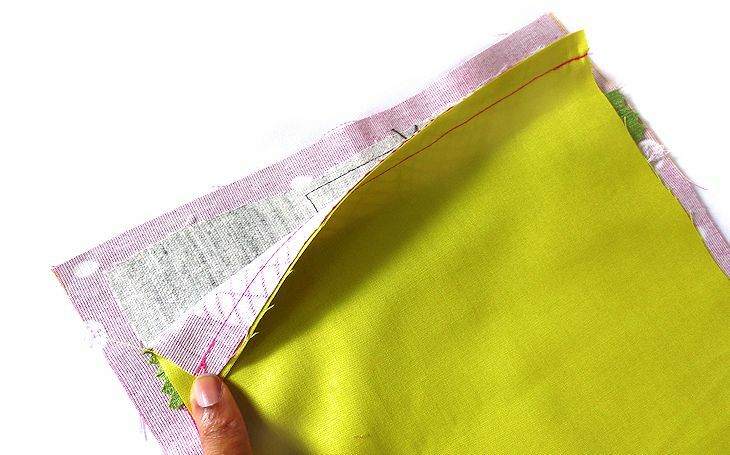 Take some time to gently press that seam with your fingers, making sure it’s as flat as possible, and that the fabric is rolled completely away from the stitch. Next we’re going to press! Please note that it is super-important that you finger-press before you apply your hot iron. The iron cannot possibly do ALL the work of making sure the welt is completely rolled to the back, your fingers have to do most of that work! 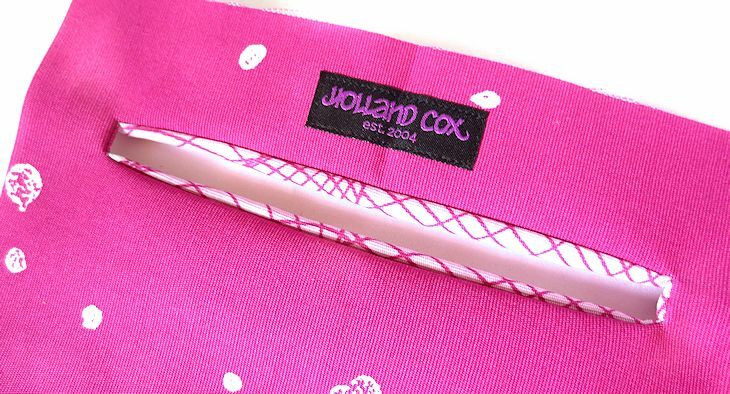 Take your time with this step, and make sure the iron doesn’t distort the fabric. If your fabric can’t take the direct heat (maybe it is very thin or has non-natural fibers? ), use a press cloth, and try only pressing from the wrong side. This is what the welt should look like from the wrong side. The opening left should be juuust big enough to create a little “window” for your zipper. If the edges of the “window” aren’t as straight as they should be, tug on the welt from the wrong side while you press, to force all of the welt to fold to the wrong side. 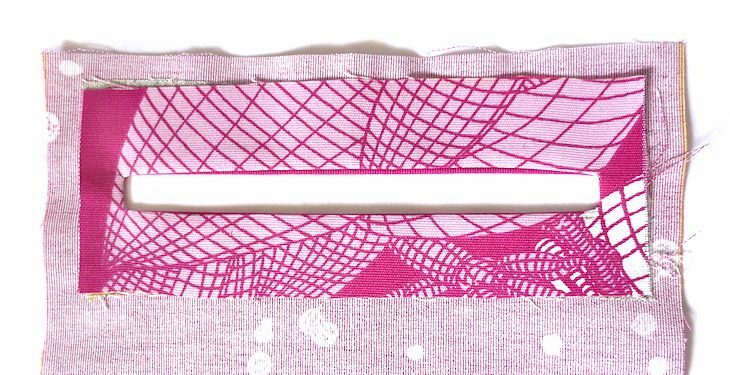 If your corners don’t look right, you can always fix them…turn the welt back to the right side, and snip into the corners a little further (without snipping through the stitches you made in step 4!). I know I sound like a broken record, but don’t rush through this step, either! 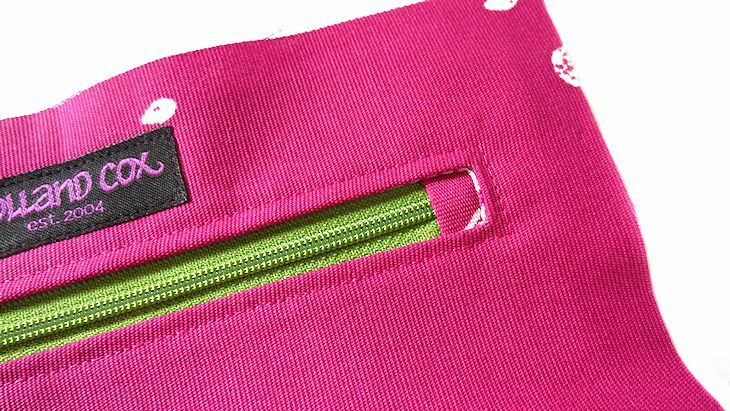 Take some time to carefully position your zipper so that the zip tabs on each end are even, and that the zipper teeth are positioned right down the center of the “window” that the welt opening forms. Again, insert your pins at an angle for best results. There are several layers of fabric under there now, so getting it all to lie completely flat will be pretty much impossible, so don’t fret. All we want is to make it as smooth as possible. I have found that keeping the zipper closed for this step is easiest, but with a very heavy weight metal zip, having the pull open a little bit might make the fabric lie flatter at that end. ~ Use a brand new needle for this step. Sharper needles mean better looking topstitching! ~ Use a slightly longer stitch length than usual. ~ Count your stitches at the short ends & use your hand wheel, just like stitching in the welt. When you get back to the corner where you started, try to end your last stitch exactly on top of your first stitch. Leave the thread tails from both ends long! This is a technique I like to use to finish of a seam whenever I can’t backstitch, or when I want to add a little extra strength to a backstitch. Use a needle to bring the end of the threads to the wrong side of the fabric, then tie the ends together in a knot, the way you’d tie shoe laces. This is a neat finish when you don’t want any messy-looking backstitches to show AND you don’t want any stray threads hanging out on the right side! Hooray! Your zipper is in, and it looks awesome! But we’re not done yet. You have zipper inserted into your fabric, but you don’t have a pocket yet! The next few steps are all about attaching the pocket bag now that you’ve successfully inserted the welt zipper. 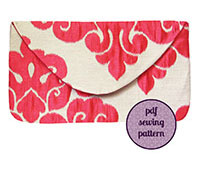 Cut your pocket bag fabric as wide as the welt, and as deep as you want your pocket to be. 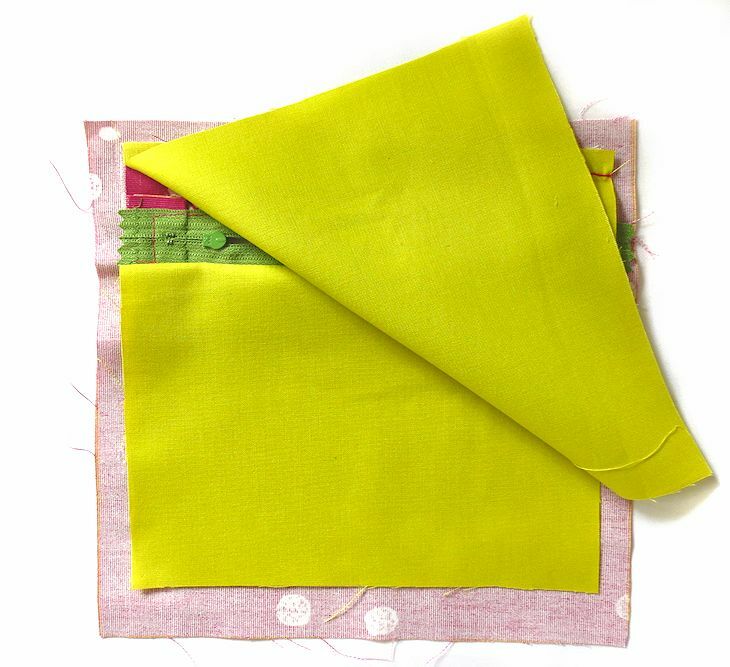 In this example, this pink fabric is going to be the lining of a 9″ x 9″ bag, so for my pocket bag, I cut two pieces of this chartreuse fabric 8″ wide and 7.5″ deep. Stitch one piece of your pocket fabric to the top of the welt, as shown in the image above. If your pocket fabric has a right side, it would be with the pocket and the welt right sides facing. This forms the “back” of the pocket, if you think of looking inside the pocket from the zipper side. Make sense? Next, attach the “front” of the pocket. 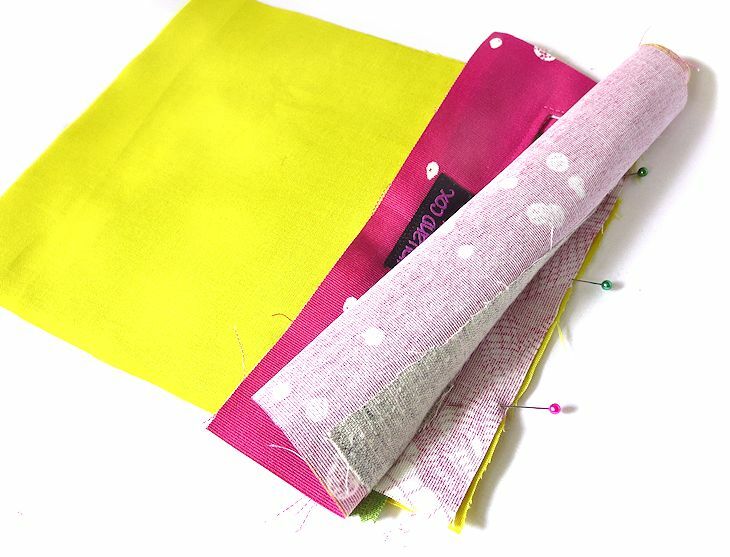 Take your other pocket fabric and attach it to the bottom of the welt, also with right sides together. This picture looks a little weird, because this step is a bit awkward. 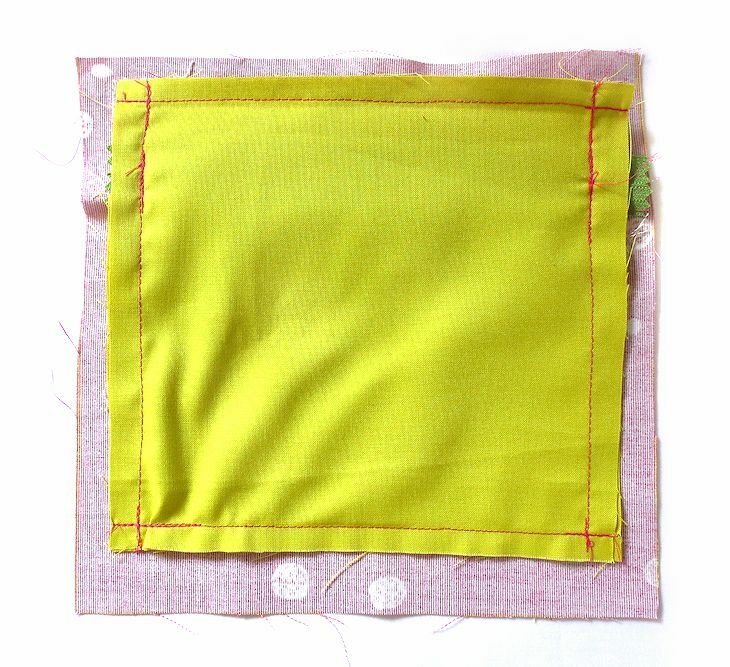 The chartreuse fabric you see to the left of the image is the back of the pocket you’ve already stitched on, it’s just folded back out of the way. The pink fabric is the rest of the bag lining rolled out of the way, so you can see the bottom of the welt with the pocket front pinned to it. Still making sense? The next step is to stitch in the ditch! Instead of stitching the bottom of the welt and the “front” of the pocket along the raw edges, you’re going to stitch in the ditch. 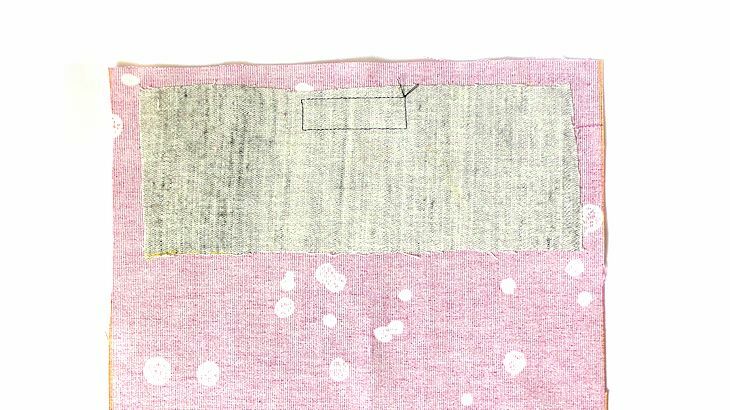 In this image, you can see the pink fabric rolled completely out of the way to reveal “the ditch” – the little ditch formed by the narrow, .25″ edge of the welt that was folded back and stitched into the zipper in steps 6 & 7. 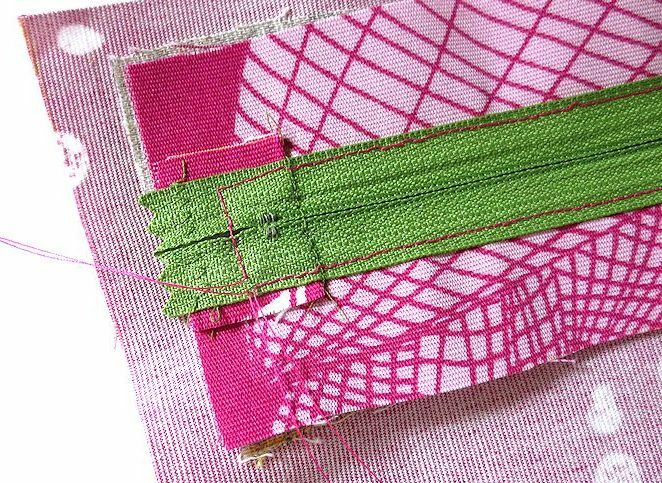 You want to stitch with your needle down in that ditch, so that on your finished pocket, you don’t see any raw edges or stitching when you look inside your pocket. 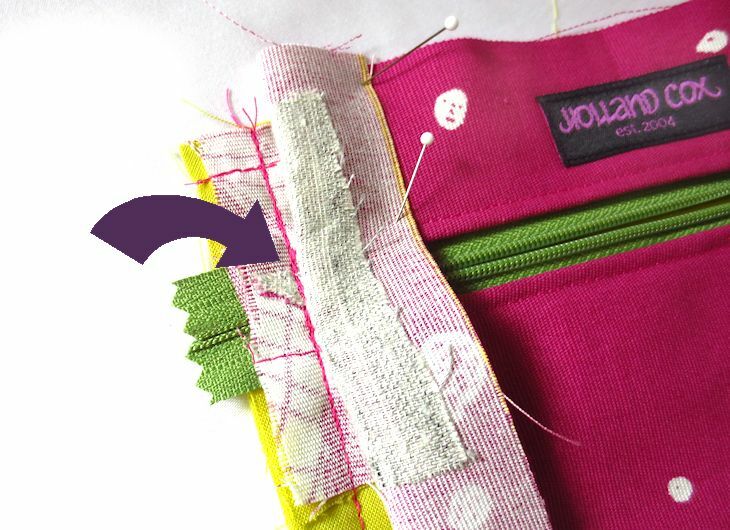 This stitch goes through the front pocket fabric, the welt, and the zipper tape, but does not touch the bag fabric or the back of the pocket, so make sure both are folded completely out of the way! This picture shows the front and back of the pocket attached (the bottom edges won’t match at this point…just trim the pocket front to match the back). Now you are ready to sew the pocket front and back together! Make sure the pocket “front” is completely flat, and then match up the sides and the bottom, and stitch together with a small seam allowance. I used 3/8″ here. This picture shows all four sides of the pocket bag sewn together. Remember, these stitches won’t be seen by anyone, so for once during this process you don’t have to hyper-vigilant! The next step is to reinforce the sides of the zipper, where the little pointed “V” from the welt is sticking out. Fold back your handbag fabric and stitch down those little “V”s through all the layers – the welt, the zipper/zipper tabs, and the lining fabric. You will definitely need to use your zipper foot for this step, the stitch must be as close to the base of the “V” as possible. This further reinforces the weak points of the welt opening, as well as provides extra strength for an area of the fabric that is going to get stressed from the opening and closing of the zipper. Finally, we’re done! If you peek inside your pocket, you can see how nice and neat it looks, since you “stitched in the ditch” when attaching the front of the pocket. Remember! This technique cuts a hole into your bag fabric, so it cannot be undone! It’s a very good idea to do a test run on some scrap fabric before you try it in a real bag. Good luck, and share pictures of your welt zipper pockets with me! part 3 is about making zipper tabs. Happy sewing and happy bag-making! Just amazing. Can’t wait to try all the zipper applications. Thanks Frances! Good luck with your zippers, I hope my tutorials help! Great job! Your directions are very clear and the pictures are a big help. But, best of all I love your choice of fabric. Your rock! Great tutorial! I was answering “No” to your “Make sense?” questions as I read through the instructions but once I got to that part when I was making my welt pocket, it became clear to me. 1. I cut the welt to be the same length as the bag so that I could catch the welt in the side seams of the bag so that the zipper was less likely to sag. 2. I left the fabric for the zipper tags extra long (on the face of the zipper) so that I could wrap the fabric around to the back to cover the ends of the zipper. There are a lot of tutorials out there that explain how to install a welt zipper but yours was the only one that I found that covers any part of the back of the zipper (inside the pocket). I don’t like raw/exposed edges. It doesn’t look as professional as I would like. I think that I could have done the “stitch in the ditch” method to cover the top of the zipper as well. Next time…. Thank you for a thorough tutorial! Karen, you are very welcome, and I like the modifications you mention! I do actually “stitch in the ditch” on both the top and bottom when I put welt zippers into my bags, it’s just a really nice finish, even if nobody ever sees it. 🙂 I’m so glad you found this helpful! 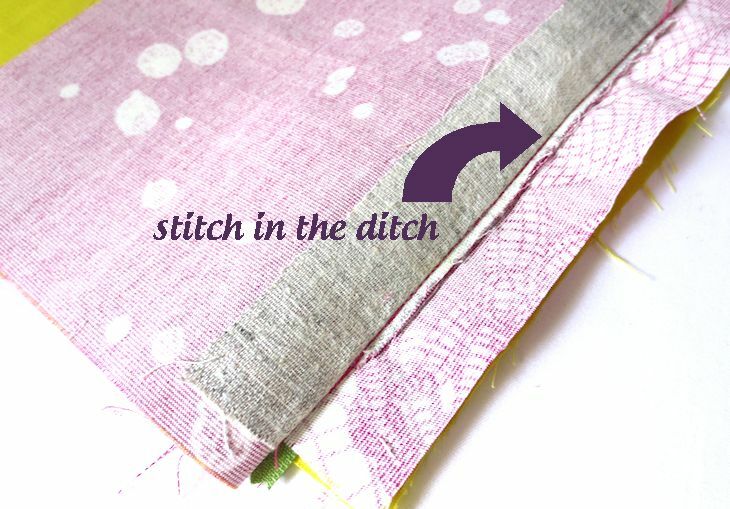 Do you have a tutorial that includes “stitch in the ditch” for the top of the welt? Do you do anything to cover the ends of the zipper tape? 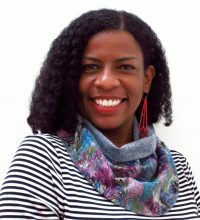 Thanks, Valerie!